Chase Dougherty, of Canby, Oregon, holds on during the PRCA Xtreme Bullriding at the Rio Grande Valley Livestock Show on Wednesday, March 14, 2018, in Mercedes. MERCEDES — The Professional Rodeo Cowboys Association Xtreme Bulls competition barreled into the Livestock Show Grounds Wednesday night. Nearly 40 riders from around rural North America put their skills to the test on the massive creatures. Parker Breding learned the ropes of the sport from his father, five-time National Finals Rodeo qualifier Scott Breding. Even though the 25-year-old was a few state lines away from his hometown of Edgar, Montana, he stayed on the feisty “Devil in Bottle” for all eight seconds until he heard the beep to signify success. Maybe the training helped but his 88 points were tied for the top spot and split the $100,000 prize earnings. Northern California resident Jordan Wacey Spears handled his bull named “Like a Boss” like a seasoned vet. 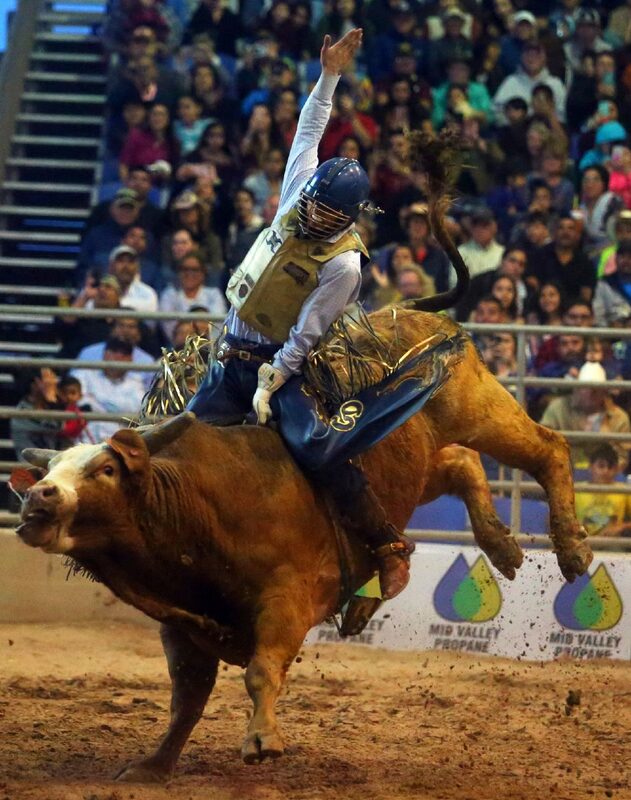 The Redding, California, native completed his eight seconds for a score of 88 points to tie Breding. Bull riders from as near as Del Rio and as far as Donahue, Iowa, tried to get to the same level as the two leaders to no avail. Brett Custer, whose father also had success on competitive circuits, said the “Xtreme” in the bull riding world comes from not just the size but the aggression of the animals they ride on a weekly basis. “You can get on a huge 2,000-pound bull that a 15-year-old can ride easy or you can get a 1,200-pound bull that would buck off world champs,” Custer said before the rodeo got underway. Custer summed up the cowboy lifestyle that he was born into as a life around animals, but the focus turned to bulls at a young age. The trip to the Rio Grande Valley wasn’t as fruitful for some competitors as others. Two-second runs were common and many riders came out of the ring holding their stomachs, groins or even heads after contact with the beasts. The cowboys who travel around the country together for much of the year say the key approach to a strong competition is a relationship with the bull. Parker McGown, who took first prize in the Los Fresnos rodeo just a few weeks ago, detailed some of the ups and downs of the sport. He finished first just a few weeks ago but was only able to finish in the top five Wednesday. McGown is a top-10 rider in the state and hopes his finish here helps improve his national standing to earn an end-of-season invite to the Wrangler National Finals Rodeo.